Summary of "Travelling Through The Dark". "Travelling Through The Dark" was written by William Edgar Stafford. William Edgar Stafford was an American poet and pacifist, and the father of poet and essayist Kim Stafford. William Stafford was born in Hutchinson, Kansas, on January 17, 1914. He received a BA and an MA from the University of Kansas at Lawrence and, in 1954, a PhD from the University of Iowa. During the Second World War, Stafford was a conscientious objector and worked in the civilian public service camps—an experience he recorded in the prose memoir Down My Heart (1947). He married Dorothy Hope Frantz in 1944; they had four children. In this poem, the poet presents a great conflict between two realities; efficiency and responsibility; and emotions warmer than efficiency and deeper than good judgement. The poet sees a dead dear while travelling on a narrow road. He finds the deer on the edge of Wilson River road. It is the best idea to push the dead body to the steep valley. Changing the direction of the car can cause the death of more deer. He gets behind the car and stands by the carcass. It has already stiffened. The poet drags the deer off. He finds that she is large in the belly. He touches the side of the deer off. He finds that the side is still warm. The fawn is lying there, it is still alive but unfortunately it will never be born as its mother is already dead. Here the physical action stops, and the emotional action begins. The poet thinks about the fate of the fawn and becomes sentimental. He cannot decide, for a moment, what to do with the fawn. The car has been stopped but the lights are on. The engine is making a noise softly as if in happiness. It is ironical that the engine looks alive whereas the animal is dead. The poet stands in the warm gases the car produces. He feels that the whole area is listening to the sound of the car. Finally, he thinks about something and pushes the deer into the river. Thus, he completes both the physical and emotional actions. In the struggle between the mind and heart, to live a practical life, he thinks one should let the mind conquer. 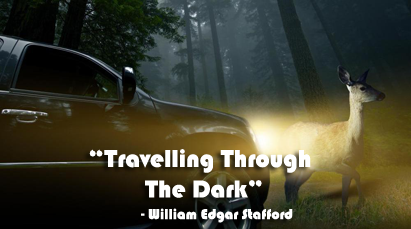 ‘Travelling Through the Dark’ is a modern poem written by an American poet, William Stafford. It is a well balanced narrative poem that shows the conflict between two realities, two systems of life. The first one refers to efficiency and responsibility which help in making rational decision and good judgment. The second system of life is connected with warmer and deeper emotions. The poet does full justices to both sides of the conflict. According to the poem, the speaker comes across a dead deer while travelling in the dark along the Wilson River road. The animal is lying dead on the edge of the narrow road. Usually, in such cases the dead bodies of the animals are rolled into the deep gorge. The reason for such a step is that any attempt to change the direction of the vehicle may cause many more deaths. Hence, the travelers in the vehicles are expected to push the dead animal into the river below, instead of swerving. The speaker stops the vehicle and stands by the deer which has stiffened already. There he notices the large belly of the animal. By touching the side of the deer, he is quick to learn that there is a fawn inside the belly and it is still alive never to be born. This discovery has a deep impact on his action. He hesitates to push the animal into gorge. For the time being, he becomes sentimental, failing to take quick decision. There his physical action is replaced with mental action of reflecting over the entire situation. Finally, thinking on behalf of the people travelling in the dark and their safety, he dumps the animal over the edge into the river. The poem is well written with a significant title. It helps in the anticipation of a serious situation. The narrative aspect of the story makes the presentation of the action quite interesting. Each stanza of the poem is carefully designed. For instance, the first stanza creates the background of the poem such as the travel in the dark, finding the dead animal etc. the second stanza deals with observation of the animal and the third stanza presents the discovery of a new situation as well as subsequent hesitation. The fourth stanza reflects the mental action. Finally both types of action get completed in the last two lines. 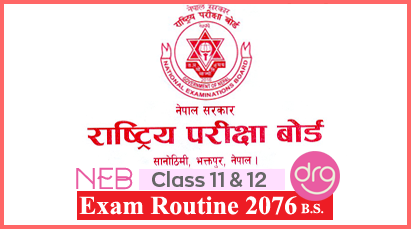 Summary In English Of "Travelling Through The Dark"
Important Summary Of "Travelling Through The Dark"
0 Response to "Travelling Through The Dark | Summary | Class 12"